Miguel Galvez was born in Paombong, Bulacan and studied under Teodoro Buenaventura. He established his own studio in 1950 and was the first Filipino to win a silver medal in the 1957 Southeast Asia Art Festival. He was a founder and leading influence in the Mabini Art Movement in the Philippines which attempted to hold the country's art influences to the more traditional forms of the culture and to resist the movement toward modernism. His paintings maybe classified into four periods: the classical period (1930s to 1948), in which he produced mainly genres and landscapes that were solidly conceived and structural elegant compositions done in rigorous impasto; his second period (1949 to 1952), encompasses his decorative phase (is meant his use of the classical skills toward the creation of landscapes, all correct in terms of technique and structure but no longer showing the vigor of his early period); third period (1953 to 1965) he went into experimental phase, he went into semi-abstraction, experimenting with neorealist expressionism and the cubism of Vicente Manansala. His fourth period began around 1967, when he returned to straight representationalism, the style he pursued until his death. 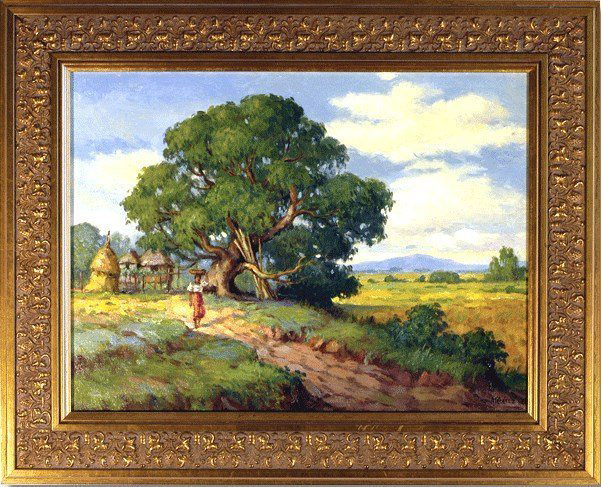 Among his awards, he was honored as the country's Outstanding Landscape Painter in 1950 by the San Miguel Corporation, second prize in the oil painting category at the Art Association of the Philippines (AAP) competition in 1949, and second prize at the Philippine Tourist and Travel Association Art. The piece in our collection is dated 1940.